The Green Labs intern team aims to help all laboratories on campus, both research and teaching, to become more sustainable. Our consultation services are designed to give UW–Madison students, faculty, and staff the information and tools they need to learn about sustainability, better understand the impacts of their practices, and create healthy and sustainable laboratory environments. The Green Labs team is currently developing a sustainable certification program that will be available to all UW–affiliated labs. The Green Labs Certification Program seeks to educate and empower labs to make more sustainable choices through their day-to-day operations by assessing energy use, waste streams, and purchasing. Below, you’ll find a directory of resources that are available both on- and off-campus. We aim to include all relevant resources on this website. If you use a tool we don’t have listed that makes your laboratory a more sustainable place, or if you find something new, please contact us. To learn more about the program, to ask questions, or to make suggestions, please write to greenlabs@lists.wisc.edu. 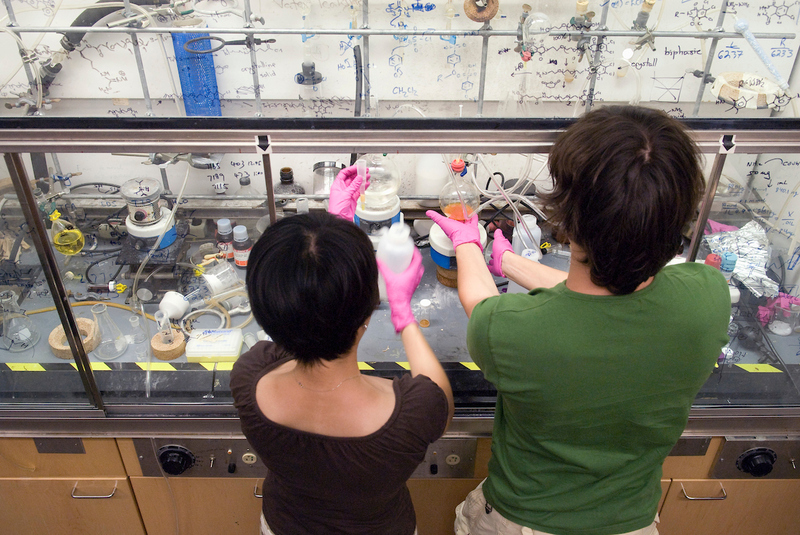 Graduate students Lingyin Li (left) and Ratmir Derda prepare materials under a fume hood in Laura L. Kiessling's research lab in the Chemistry Building. Photo by Jeff Miller.